Press release from Bright Kids Studley. 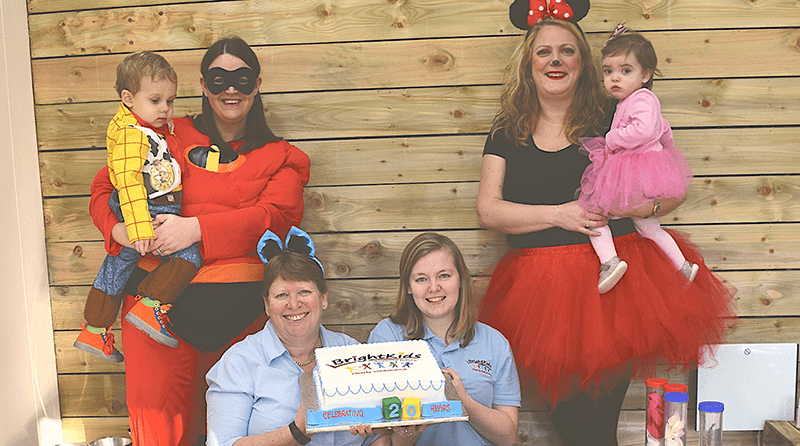 There were Mickeys, Minnies, princesses and a whole array of other Disney characters as staff and children at Bright Kids Studley celebrated their award-winning nursery’s 20th birthday this week. Set up by local entrepreneur and mother-of-two, Tricia Wellings, Bright Kids Group’s flagship setting on The Slough, Studley, opened its doors on 18th January 1999 – with just four children and three members of staff on the books. Studley soon became a huge success, obtaining lottery funding to set up out of school care and filling the books within the first 12 months. It has gone from strength to strength over the years and now employs 16 staff and cares for 55 children. Last year, Childcare Minister Nadhim Zahawi, visited to open a brand new facility at the nursery, affectionately known as The Chalet, which has seen it expand to offer free stay and play sessions to the local community as well as additional space for the children in its care. It also celebrated achieving Millie’s Mark accreditation last year – an initiative set up following the tragic death of nine-month-old Millie Thompson who choked whilst at a nursery in Greater Manchester in 2012. Millie’s Mark recognises childcare providers that go above and beyond government requirements and have 100% of staff trained in paediatric first aid. Bright Kids Nursery Group Owner, Tricia Wellings, has also achieved great success through her early years ventures and, following the success of Studley, has since opened a further two nurseries, in Crabbs Cross and Northfield, four out of school settings and an early years training centre and early years products provider. Tricia was recently a finalist in the Nursery Management Today Lifetime Achievement Award and is currently in the final four of the Pride of Stratford Business Person of the Year Award. For more information, please call 01527 852165, email studley@bright-kids.co.uk, or visit www.bright-kids.co.uk.